Hortensia and Haroula are sunning themselves on the terrace of Dina Petsis in the village of Lia, as they watch Dina prepare the bread called "prosphora" for lunch. Dina makes the dough with yeast and flour, kneads it and punches it down and then waits for it to rise. Just before she slides it on a paddle into the bee-hive-shaped outdoor oven, she stamps the dough with a bread stamp. The square in the center presses out the letters "IC XC NIKA" which stands for "Jesus Christ Conquers". When Dina takes the bread to church, the priest will bless it and he'll cut out the square in the middle of the bread and mix it with wine for those who take communion. The rest of the loaf may be cut up for the antidoron, which is passed out at the end of the service. It's an honor to bake the prosphora. The cats are proud that their mistress was chosen, and that she's the best cook in the village. They're sitting under hydrangeas - some of them planted in empty tins from feta cheese and olive oil that Dina uses in her cooking. They love watching the baking and the way the bread smells as it cooks. 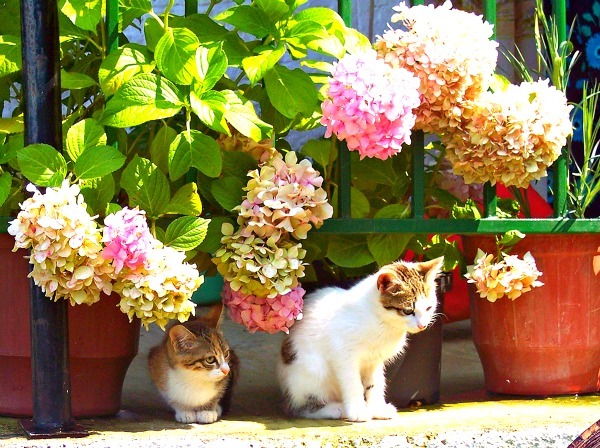 Greeks call the hydrangea flower "Hortensia" and that's where the cat on the left got her name. Her sister is named Haroula, which means "Little Joy". Learning to cook and eating Dina's food are some of life's many joys in Lia. 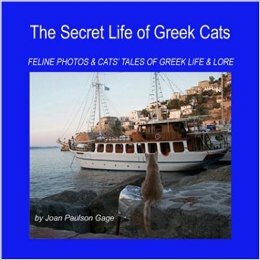 Pictures and text come from the book The Secret Life of Greek Cats: Feline Photos and Cats' Tales of Greek Life and Lore by Joan Paulson Gage. I love their big eyes!! ~ Great bit of story too. Those are some pretty kitties. And a very interesting story about the bread too. Love the story about the bread. The cats' names are also very cute! I never knew that a hortensia is called hydrangea in English. IN Dutch, we call them hortensia too. Kitties from my country!!! Sooooo cute! Such sweet faces! Have a lonely new week, sweetheart! I was reading the blurb, not realizing a book was coming after it, and wondering, "These kittens do all this?!" lol I'd love to see Greece one day. They are sure such cuties! What an interesting story! Cute photos, too. beautiful eyes, interesting photo concept. As a cat lover I quite enjoyed this! I'd love to get to Greece one day! Really adorable photos of cats!!! The little orange one reminds me of Dobby off of Harry Potter! I hope they got something else than bread ! They are so cute ! So sweet in that sunshine! 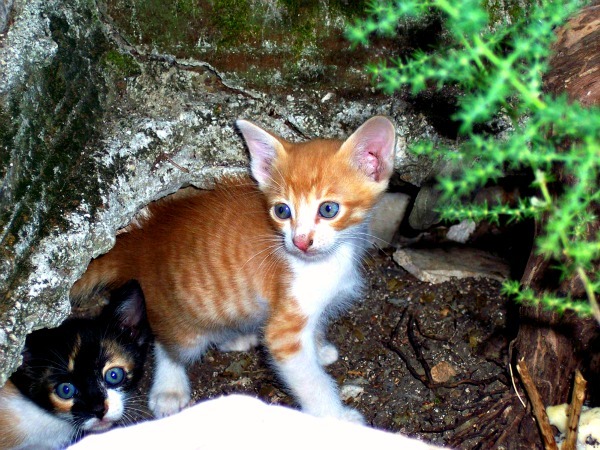 haha Those kitties peering out from a cave look awesome...such pretty blue eyes and they don't look Siamese. Thanks for the awwww moment. There are tons of cats all over Greece. TW knows cos her ex was Greek and he’d bring her books and calendars filled with the cats of Greece. Oh my gosh, I want to take those kittens home. Such cute kitties and proud of their mother. They both have lovely eyes! La Grèce est un pays de lumière. Cela donne de très jolies photos. C'est intéressant cette histoire de pain. Lorsque je vois des chats grecs j'ai beaucoup de nostalgie. Je repense à celle de mes soeurs qui n'est plus là. Elle avait une jolie petite minette qui venait de l'ile de Skiathos où son chéri possédait une maison. Elle avait eu beaucoup de mal à convaincre les habitants de leur petit village de la lui laisser. Les chats sur les iles grecques appartiennent souvent à tout le monde et sont jalousement gardés. What an interesting story...and such cute cats! They are so cute! We love the little one with the big ears! Very cute. Our entry today too is a kitty from Greece. Love the names Hortensia and Haroula. Great pictures! What lovely pictures of beautiful kitties! And we really liked that story, too. Beautiful photos and gorgeous kitten! Have a nice week-end, Vanessa. Thanks for linking up to Pin Worthy Wednesday, I have pinned your post to the Pin Worthy Wednesday Pinterest Board.